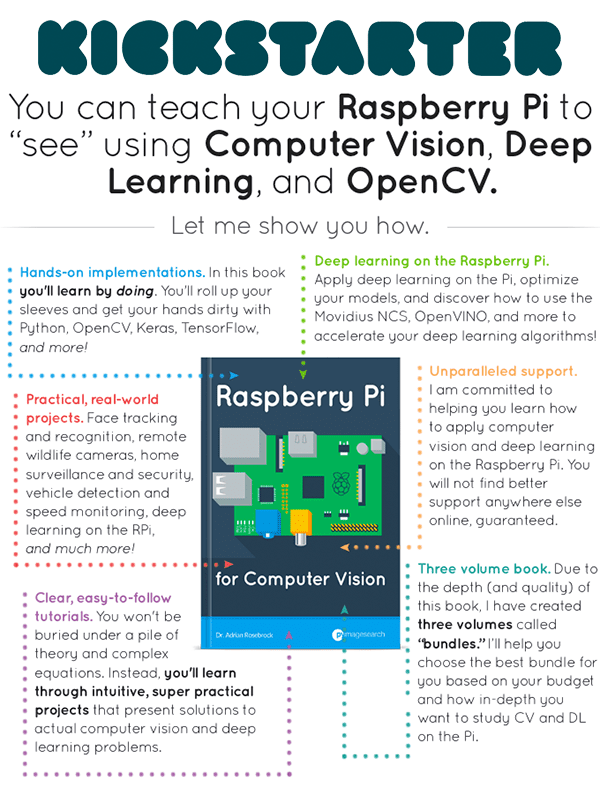 The Raspberry Pi for Computer Vision Kickstarter is officially LIVE! And remember, I’m offering an additional 15% OFF the already discounted bundle prices for the first 10 minutes of the campaign. (10:00-10:10AM EDT). This is a massive savings of 30-35% the entire PyImageSearch library. But as soon as the clock hits 10:10AM EDT I’m taking down the additional discount. No exceptions (but you’ll still be getting a great deal from the special Kickstarter pricing though). If you’d like to take advantage of the special pricing, you’ll definitely want to act now! My hope is that you’ll use this opportunity to make the most of the sale and continue studying computer vision, deep learning, and OpenCV. I’ll be with you every step of the way.